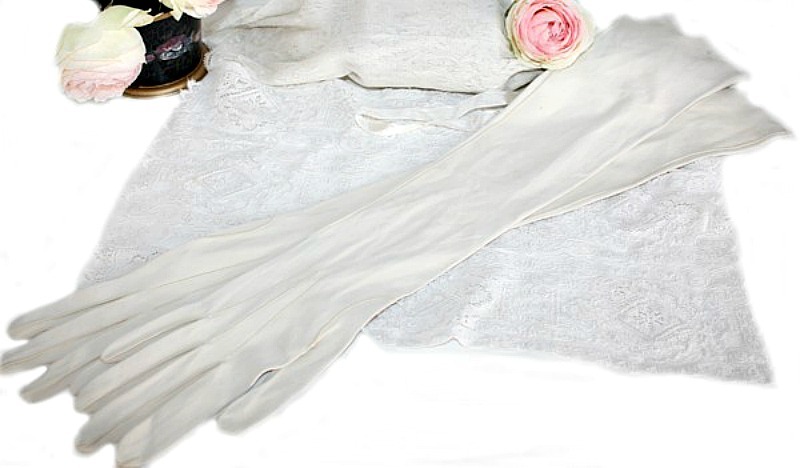 Fabulous hand made Opera Gloves, custom made for a treasured and quite fortunate woman, well taken care of. Perfectly stored for decades by a collector, these are super fine and ultra thin leather. Such a luxurious pair to display with all your antique French Boudoir dresses, millinery and mannequins. Absolutely divine, it's so rare to find a pair of high quality gloves in this condition. There is a small amount of storage staining on the fold of one of the gloves. Measure 16" long, 3" across the knuckle portion of a lady's hand.